Give your guests functional flatware with the Choice Dominion 7" 18/0 stainless steel medium weight dinner fork. Featuring a classic shape, this fork has a simple appearance but is designed to perform well and hold up to everyday use. Pair it with the rest of the Windsor line to create a coherent and attractive table setting. Your guests are sure to appreciate this flatware, and it won't break your budget! This Choice Windsor dinner fork is a cost effective alternative to pricey name brands. You will not have to worry about breaking the bank on expensive forks with this economical choice. Made of stainless steel, it will be a long lasting and attractive addition to your busy dining area. It is great for relaxed environments like pizza shops, cafeterias, coffee shops, or burger restaurants. Our flatware usually gets thrown away by our customers. 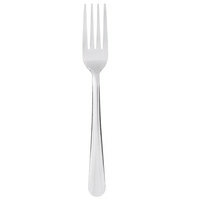 the Choice Dominion 7" 18/0 Stainless Steel Medium Weight Dinner Fork - 12/Case is a quality product w a great price. Great price, just regular forks for back up if visitors come over. Always good to have some extras, and the price is cheap and good quality. Forks arrived, individually wrapped and look good. Just cleaned them and looking forward to using them! Perfect length and weight. Tines get out of alignment easy and detract from the classy look. I got these forks last week. They are medium weight and good for every day use. They are also good for small parties, if you don't want to use disposables. Great quality dinnerware. Very durable and heavy weight. Easy to clean and also easy to polish. Great price fir the amount that you get as well. Great Product and conveniently sold as a pack of only forks, which is the only utensil that I really needed more of! have an excessive amount of spoons and knives in all different sizes, but somehow over time, many of our forks have gone missing. These are great industrial utensils to have. They are sturdy and do not bend easily. Great stainless finish on them, they look appealing and professional. Great price for a simple and durable fork. Individual wrapping was annoying to unwrap but well worth it for these forks. Seems to hold its shape and cleans well too. Would buy again. Will be using these for my wedding! Great value for a great price! Forks are sturdy and look great. i am looking forward to ordering them. Thank you! I am not sure how long these will hold up but they are absolutely perfect for what I need at the time. Perfect for my small cafe. Does the job for an inexpensive fork. Not too heavy or light. We've used these dinner forks for almost 2 years and will keep ordering. This fork doesn’t easily bend or break. It’s very sturdy and durable. You can not beat the price for these forks. Also availability in the same design is the knife. So great product 10 of 10 for review. Will purchase more! Highly satisfied and pleased! Thanks! Great value. This price and quality cannot be beat. It is really nice to have these that have a good quality but not a huge price tag. These dinner forks work well for their price point. The tines bend rather easily, but can be bent back, if not at the price you can just throw them.out and order new. These seem to be nice forks for the money. We haven't put them into use yet, but look as though they will hold up well through the dishwasher and every day use. These are a great size for adults as well as kids. It has a good weight to them. The pattern is very simple and pleasant. A good light weight fork. Perfect for dessert or salads. They bend slightly with some pressure. Look good for our dine in customers. Price us right for the size. These medium weight dinner forks are great for eating just about anything. The price is what really sells it. They do bend upon pressure though. This the silverware that I use in our Memory Care unit. It is light weight and work great for the residents. The price is very good. You really can’t beat the price of these forks. Even dollar stores forks are way more expensive. I am very pleased with the quality of these, considering the low price. This fork was useable but too light than I anticipated. It did the work but it is not professional. for home use for children will be ideal but not events. Excellent quality fork! Ordered along with the dinner knife and tea spoon for a large dinner party. Couldn't be more pleased with the quality! Arrived quickly and are individually wrapped in plastic and boxed by the dozen. I compared prices with the plastic that looks like silverware and these are actually cheaper! Definitely worth the money!! Great forks at an amazing price. It's a fork. It's easy to clean. It is a pretty good quality. I would recommend to family and friends. Exactly as described - a good medium-weight cafeteria fork. Nothing fancy, but well-made and decently heavy - especially for the price! Bought for a large party & will continue to use. This fork is great and I like that there is other matching flatware. The quality is great. I bought them for a large party but will be able to continue to use them after that. I'm happy with our purchase of these forks! They are not only inexpensive, but they seem to be sturdy enough to hold their own through numerous washes. Happy with our purchase! These steel dinner forks have a sturdy built to them that prevents them from bending easily and helps you minimize costs by using them for a much longer time. They give your table set ups a great look and are easy to clean. Great product overall. Decent quality for a fork, but seems to be made of a less sturdy material than traditional flatware. However, it's a good choice for large quantities of people being served. No frills, nothing fancy, just a basic fork. These are nice. They are a heavy quality for the low price! They do not bend and I have to say I have not seen many scratches! love the quality on these things. the look is great as well. While they are very easy to clean sometimes you have to really put your elbow in to polish. If your looking for an alternative to plasticware and not break the bank these forks fit the bill. Great for cookouts anf bbqs. Not recommend for upscale dining. I purchased these forks for a dinner party. They were ok for what I needed them for. I would consider them light weight not medium. Great deal on something simple that all restaurants need to have. They work great and don't bend much at all. Eventually they get dingy but they can be replaced. These choice dominion 7" 18/0 stainless steel medium weight dinner fork 12/case are cheap and work decent. Can't beat the price. Always order extra to have since somehow they end up in the garbage a lot.